PETROFLO MULTI-VEHICLE AUTOMATIC TRANSMISSION FLUID is a special blend of high quality base stocks with an advanced additive system for automatic and powershift transmissions. PETROFLO MULTI-VEHICLE ATF meets the performance requirements of a broad range of automatic transmission applications. PETROFLO MULTI-VEHICLE ATF is formulated to provide the protection that meets or exceeds the quality standards in the industry. The specially balanced additive system protects against shudder, eliminates the need to stock ATF supplements and ensures a high-performance smooth driving experience. Carefully balanced friction modifiers allow friction retention for long life performance and maintain the smooth lock-ups required by a wide variety of vehicles. Enhanced oxidation, thermal stability and corrosion resistance helps maintain year-round protection of the transmission components. PETROFLO MULTI-VEHICLE ATF has been formulated to be suitable for use as a Service-Fill ATF additive for Asian step-automatic transmissions calling for Toyota T-III and T-IV, Honda Z1, Nissan Matic D and Matic J, and Mitsubishi SP-II and SP-III performance. Also meets the requirements of JASO 1A and other Asian OEM’s like Hyundai, Subaru and Mazda. It is suitable for use in automatic transmissions calling for GM DEXRON IIIG/H, Ford MERCON and Allison C-4. In addition it meets the requirements of European OEM’s like ZF TE-ML-14A,Voith 55.6335, MAN 339 Type Z-1 and MB, VW and BMW 4- and 5-speed automatic transmission specifications. 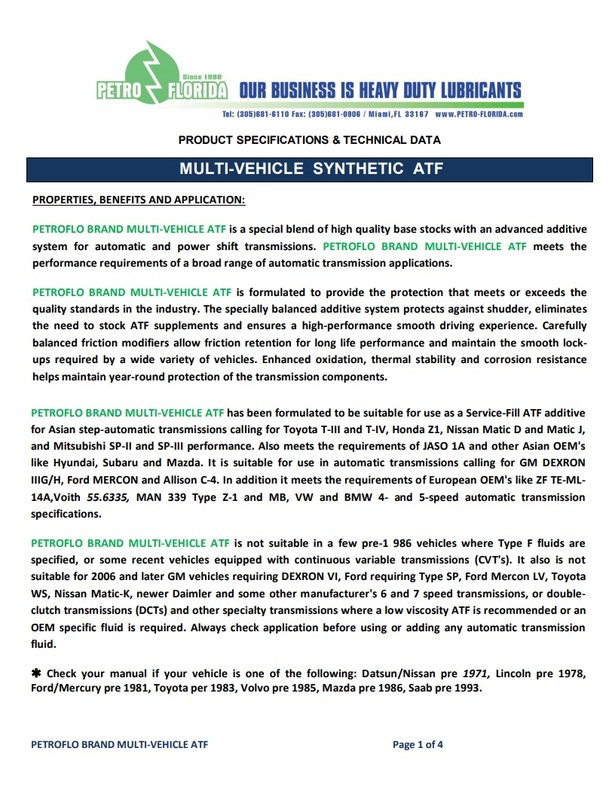 PETROFLO MULTI-VEHICLE ATF is not suitable in a few pre-1 986 vehicles where Type F fluids are specified, or some recent vehicles equipped with continuous variable transmissions (CVT’s). It also is not suitable for 2006 and later GM vehicles requiring DEXRON VI, Ford requiring Type SP, Ford Mercon LV, Toyota WS, Nissan Matic-K, newer Daimler and some other manufacturer’s 6 and 7 speed transmissions, or double-clutch transmissions (DCTs) and other specialty transmissions where a low viscosity ATF is recommended or an OEM specific fluid is required. Always check application before using or adding any automatic transmission fluid. Check your manual if your vehicle is one of the following: Datsun/Nissan pre 1971, Lincoln pre 1978, Ford/Mercury pre 1981, Toyota per 1983, Volvo pre 1985, Mazda pre 1986, Saab pre 1993. 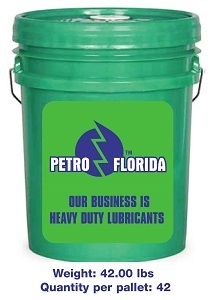 PETROFLO MULTI-VEHICLE ATF can be used in some passenger car manual transmissions trucks and buses, offhighway construction/mining equipment, agricultural equipment, mobile hydraulic systems, industrial machinery, and power steering systems where DEXRON, DEXRON -II, DEXRON -lIE, DEXRON -III (H), MERCON or MERCON V type fluids are specified. 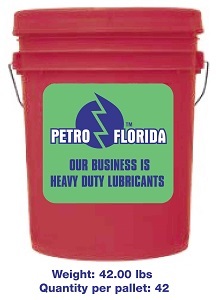 PETROFLO Type A Automatic Transmission Fluid is blended from proven performance base oils and is recommended for use in automatic transmission requiring Type A Fluid. Type A is an economical fluid and is recommended for use in older transmissions where leakage and consumption may be a problem. A red dye is added to help detecting leaks by differentiating transmission fluids from other automotive fluids. Type A is not recommended for use where Dexron® or Mercon® fluids are specified. • Use single ATF for many specifications and applications without using ATF supplements. • Optimum frictional properties for smooth shifting and excellent anti-shudder performance. • Outstanding oxidation and thermal stability. 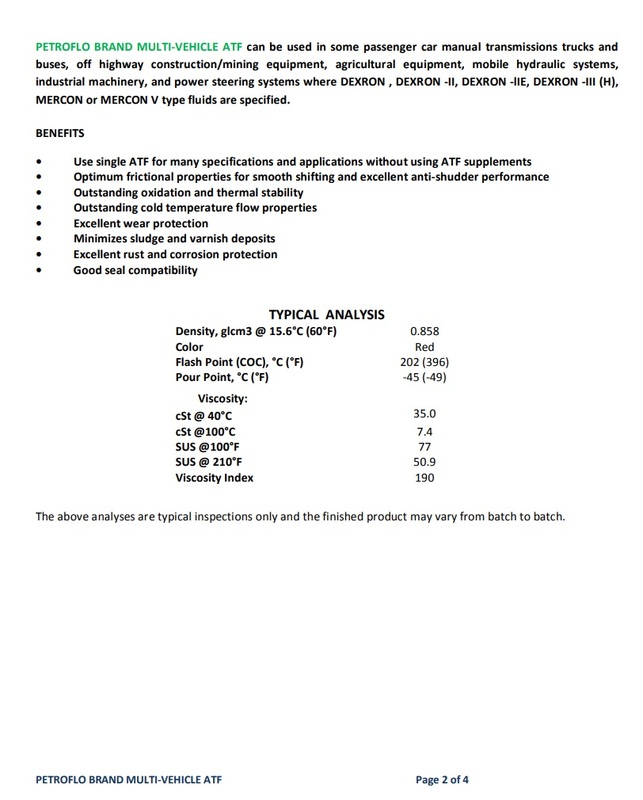 • Outstanding cold temperature flow properties. • Minimizes sludge and varnish deposits. • Excellent rust and corrosion protection.